We’ve also added a new feature to the API documentation called InstAPI link. 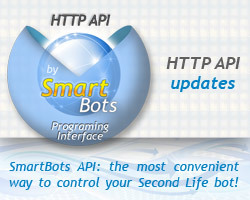 It allows developers to click the link in API documentation and get our API Test Suite filled with the necessary data. Developer just needs to put the bot name, bot access code and his developer’s key. Moreover, if developer already used the API Test Suite once, the bot name and other data will be substituted automatically. You can view a list of all our HTTP API commands here.